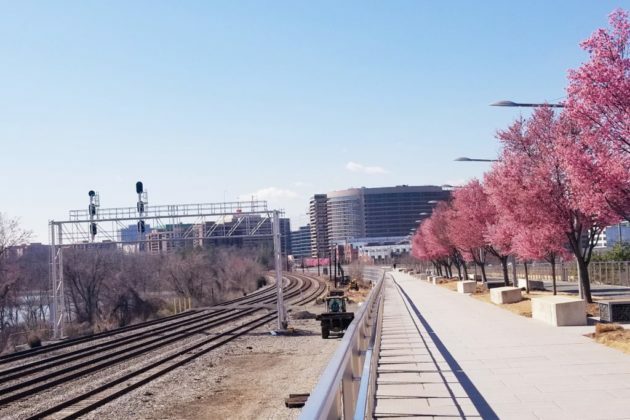 (Updated at 12:33 a.m.) A row of trees lining the railroad tracks near Long Bridge Park in Crystal City is no more after CSX crews began removing them last week, upsetting some residents who say they were an important part of the park’s aesthetic. Dominique Williams lives nearby in Crystal City and says she comes to the park every day for an afternoon walk. After not visiting for the last week, she was shocked to see the trees gone when she went on a stroll earlier this week. “When I saw it this morning I said what is going on?” said Williams, gesturing at the pile of broken limbs once a part of the trees she said gave a je ne sais quoi to her daily stroll. Crews could be seen cutting up stumps and gathering timber for the shredder along the train tracks on Tuesday. Arlington Dept. 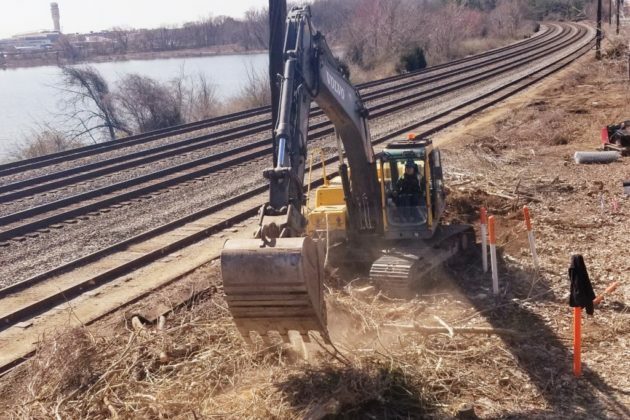 of Parks and Recreation spokeswoman Susan Kalish told ARLnow that CSX is removing the trees, not the county, as the land where the trees were growing belongs to the freight rail company. 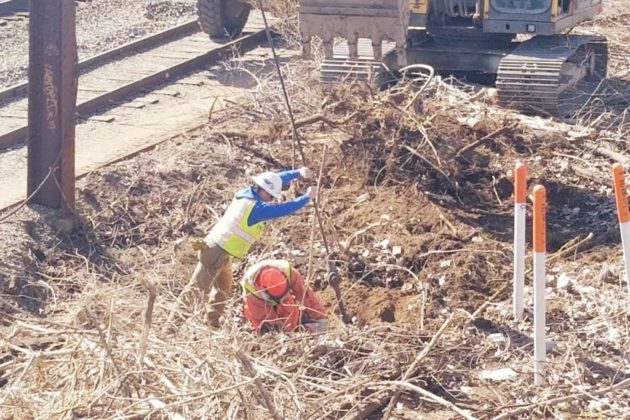 CSX spokeswoman Sheriee S. Bowman said the company to aims to “positively impact the environment” but had to remove the trees due to an ongoing construction project to build a road running parallel to the tracks. 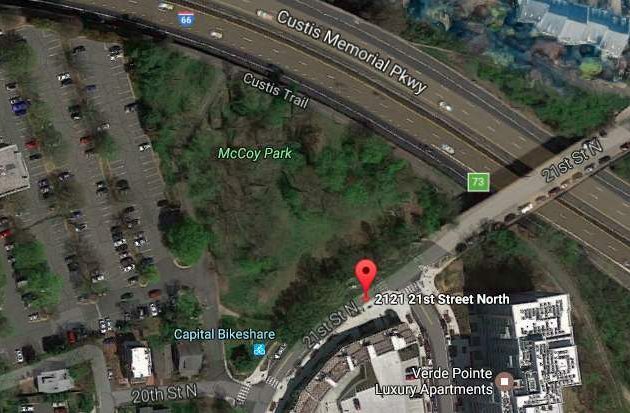 Late last year the company notified the Crystal City Civic Association that it intended to remove trees for the construction of a planned access road near the park. CSX has submitted plans for County permits to install an access gate at the 12th Street entrance to Long Bridge Park and an access road along the tracks. This replacement is needed since the current access at the northern end of Long Bridge Park will end when the County’s construction of the Aquatics and Fitness Center starts. The issue will come before the County Board this Saturday, December 15, for approval. CSX has shown that the gate and road will be built on its property. There will be no changes to the entrance to the park, 12th Street, or Crystal Drive. Beyond the end of the map shown, the road will run parallel to the tracks for about a half mile up to the signals. It will be asphalt from the gate down to the track level and gravel the remainder to the signals. 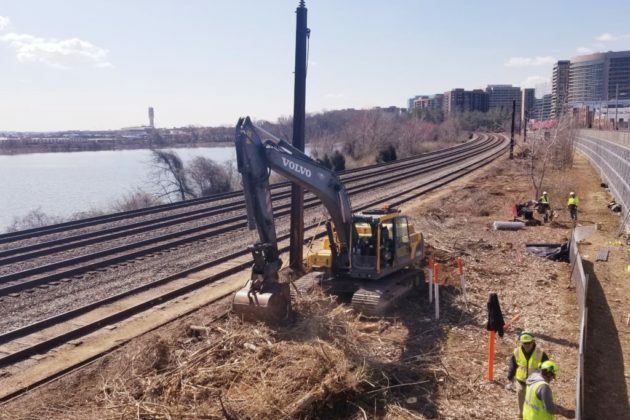 CSX designed the project with the goal of disturbing as few trees as possible, but due to the limited property parallel to the tracks, some removal on CSX Right of Way is unavoidable. However, the plan includes extensive tree and shrub replanting after construction with more trees and shrubs than are there today. After construction, the new access road (which will be on CSX ROW parallel to the tracks) will be used by light pickup trucks for the signal maintainers and track inspectors. Under normal circumstances, they would probably use the access road 2-3 times a week. Another Crystal City resident said it’s important to balance business needs with the community but that her family will miss the trees when they come to the park now. Jim, a retired Fairfax resident who also uses the park, said “overall it’s a positive” that the trees are gone because it also led to the removal of litter and construction debris — what he described as a “garbage dump” — next to the tracks. Arlington’s lengthy, detailed public space planning documents might seem dry and technical at first glance, but an impending update to those plans has sparked a bitter fight in the county. Though the sparring centers largely around reams of statistics and data, the debate cuts to the heart of a key question for leaders in the 26-square-mile county: how should Arlington divvy up its limited amount of public land? The newly revised “Public Spaces Master Plan” is designed to provide lots of answers to that question for Arlington officials. Last updated in 2005, the document sketches out the county’s goals for building and maintaining its parks, fields, trails and other open spaces. Since 2015, community leaders have been working to update the document in a process commonly known as “POPS,” or “A Plan for Our Places and Spaces.” A county advisory committee has been sharpening the document’s specifics for months, and the County Board now looks ready to schedule public hearings and a vote on the plan’s update this weekend. But critics charge that the plan is fatally flawed, and some have spent more than a year working to build opposition to one of its key elements. Chiefly, they’re concerned that the new document calls for the county to set aside more space for athletic fields than it actually needs, which could gobble up room for other important facilities (namely, schools and parks). Opponents of the plan also argue that county staff have been deceptive in providing data to guide this process, undermining many of the master plan’s conclusions. 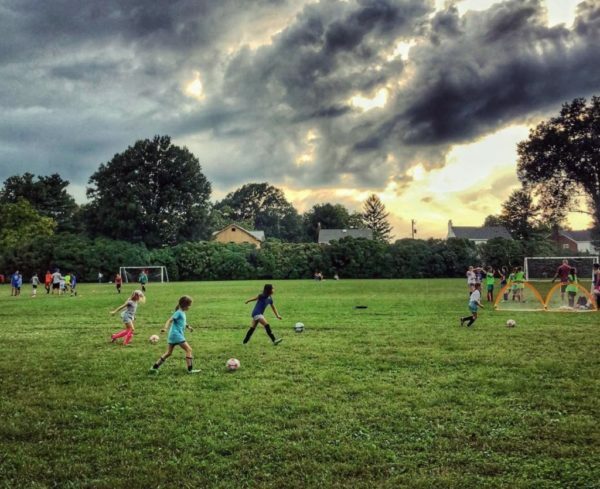 Others close to the process, especially those representing parks or sports groups, feel those concerns are misguided, and insist that the new plan will provide an adequate roadmap for meeting the growing demand for field space in Arlington. But, with the issue coming to a head in the coming weeks, the plan’s critics are hopeful that the Board will take their concerns seriously and act accordingly. Both critics and supporters of the plan acknowledge that the latest draft of the document has gone through sufficient changes since it was released last fall to be a lot more appealing to all involved. Yet emotions around the issue are, undoubtedly, still running high. How many more fields does Arlington need? Rousselot, who has long been active in county politics, says he became interested in the issue as other local activists began to bring it to his attention. Kari Klaus was a key driver of those early efforts, based on her previous work examining the county’s plans for parks in Aurora Highlands, and the pair worked with some other concerned community members to found Parks for Everyone. Chiefly, Klaus and Rousselot became concerned about the plan because of one, highly technical, piece of data contained within the document: something called “population-based level of service” analysis. In essence, the calculation involves county staff looking at Arlington’s population data, national averages and other “peer localities” to see how many parks and fields Arlington needs to serve its residents. In this case, staff judged Arlington’s peers to be other suburbs of major cities including: Alexandria; Bellevue, Washington; Berkeley, California; and St. Paul, Minnesota. Using that data, staff came up with ratios designed to guide how many facilities the county needs to add going forward. For instance, Arlington currently has 53 rectangular, athletic fields — the plan’s estimates suggest the county should be striving to have closer to 61 instead. Similarly, the document shows that Arlington has 43 “diamond” baseball fields, while 54 might be a better number to serve its current population. And both of those projections will only grow as the county swells with new residents over time. Those estimates disturbed and frustrated Rousselot and Klaus. They say they couldn’t understand how the county landed on those figures, instead of relying on current data showing how often people use the county’s existing fields. Several people interested in the matter filed a series of public records requests to get more county data, and became increasingly frustrated that staff would only release limited information about their process for calculating those numbers. But, from what they did find, Rousselot and his fellow critics became convinced that the county’s Department of Parks and Recreation wasn’t following the industry’s best practices for coming up with “level of service” calculations. They argue that the number of people actively seeking to use county fields would provide a much better baseline to work off of than simply the number of people living in the county in total. Haynes echoed that point, stressing that all of the advisory committee’s work suggested that the population-based calculations were the “most straightforward method” possible for staff to use. Otherwise, she says the county would have to rely on a cascading series of assumptions about how much field use would increase (or decrease) over time, which might prove increasingly inaccurate as time goes by. Rousselot, however, argues that such a standard for calculating field needs is “deceptively simple,” and doesn’t allow much room for nuance as decisions get made in the future. Is demand real, or deceptive? But Haynes vigorously defended county staff’s management of the process, and their willingness to re-examine their own methods. She said the advisory committee has broadly been “very pleased” with the county throughout the process, which she finds slightly “incredible” given that they’ve been working together for the better part of four years now. And she believes that the open space plan’s critics miss an obvious point about the county’s current conditions — field space is already at a premium for sports teams and casual users alike. But Rousselot and the plan’s critics charge that field demand can be deceptive — he sees the county’s management of its fields as the root cause of any problems. Many field reservations are managed by volunteers, not county staff, which he feels has led to plenty of inefficiencies. Other fields are unusable because they haven’t been maintained well, which Rousselot chalks up to the county’s shrinking maintenance budget. Haynes argues it would not be “an efficient use of county resources” to task staff with managing fields, and says the county has done some work with its Sports Commission to encourage better communication with sports leagues to determine who needs certain fields and when. And Schwartz pointed out in his statement that the county is currently reviewing its processes on both those fronts. “We do not have it figured out yet — but we are doing better maintenance, better scheduling, and creating more opportunities for the fields to be available for casual use when not scheduled,” Schwartz wrote. Fundamentally, Haynes believes that the county has been responsive to all of the concerns Rousselot and others have raised. And she doesn’t want the concerns of a few critics derail the passage of a plan that’s been years in the making, particularly when many others support it. A petition backed by the Arlington Sports Foundation supporting the plan now has nearly 1,300 signatories. But Rousselot and his allies believe they’ve convinced enough people around the county of their point of view that they are more than just lone voices in the wilderness. Most notably, the Arlington Civic Federation, one of the county’s oldest and most revered civic organizations, threw its support behind their efforts. Rousselot and other critics presented their case at one of the group’s meetings, and after some follow-up study of the plan, the federation’s members voted 66-17-3 to issue a resolution broadly echoing Rousselot’s critiques of the plan. “The fact that they have come out so overwhelmingly in favor of this makes it pretty hard for people trying to argue that it’s four or five malcontents raising these issues,” Rousselot said. Rousselot credited the group’s intervention for spurring some changes to the plan, and even Haynes would agree that staff and her committee has been able to make some tweaks to the document in recent weeks. Specifically, she said they’ve sought to stress that “this is a high level planning document, it’s not proscriptive,” particularly when it comes to how closely the county should follow its recommendations about how many fields it needs to build. As Rousselot puts it, the revised plan “softens the Moses tablet-like” quality of those recommendations, making it a bit less likely that officials hew quite so closely to those numbers in the future. Still, the document’s critics would rather see the population-based level of service recommendations removed entirely before the plan is passed, but that looks increasingly unlikely. The lone Board member to support revisions to that part of the plan was John Vihstadt, Cristol wrote, but the independent lost his seat to Democrat Matt de Ferranti last fall. Accordingly, it would seem the current plan has enough support to pass in its current form sometime this spring. The Planning Commission voted last night (Wednesday) to recommend that the County Board advertise public hearings on the plan at its meeting Saturday — that would set the stage for a final vote on the plan in April. With the process nearing its conclusion, Rousselot is encouraged that Parks for Everyone achieved some of its goals. But he’s still holding out hope that leaders will just go a few steps further in tweaking the plan’s prescriptions. 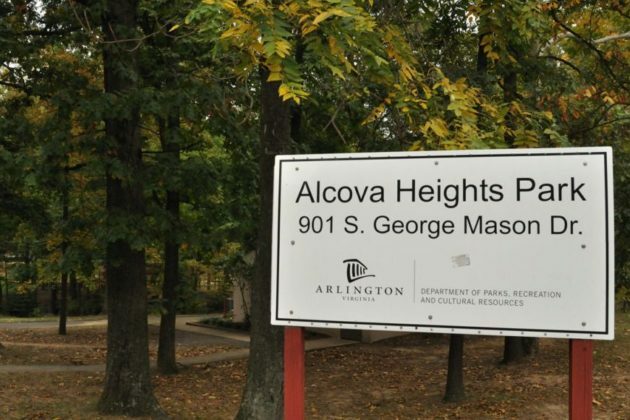 Alcova Heights Park is set to see some renovations next year, and county officials are getting ready to unveil their plans for the park’s improvements. The county plans to hold a meeting Thursday (Feb. 21) at 7 p.m. at the Arlington Mill Community Center (909 S. Dinwiddie Street) to discuss new designs for the park. 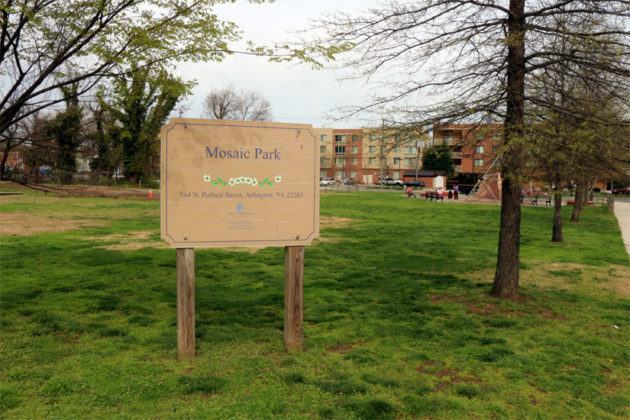 Officials began planning for a refresh of the green space, located at 901 S. George Mason Drive, this past fall and held a few community meetings on the topic. 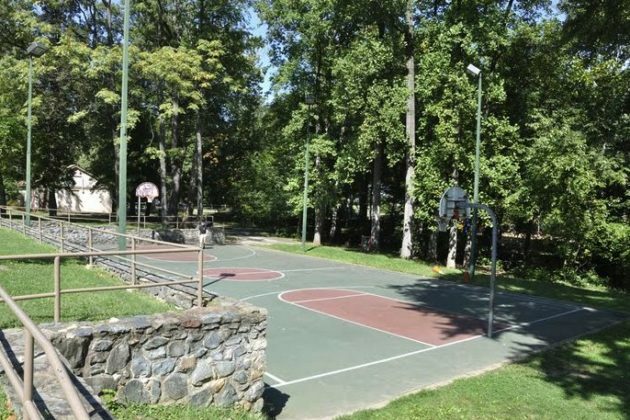 Though the county will only detail the full extent of its plans at the meeting later this week, proposed improvements include the renovation of the park’s basketball court and lights, as well as its sand volleyball court, according to the county’s website. The park’s large picnic shelter and restroom could be in for some upgrades, and the county also hopes to add improved signage and landscaping to the area. Improving the park’s drainage and stormwater management will be another key focus of the work, particularly after several residents mentioned muddy conditions at the park in a survey seeking to identify potential improvements. The county hopes to finalize designs and start construction on the renovation work by the third quarter of 2020, then wrap up that work by the second quarter of 2021. Eventually, officials plan to overhaul the Alcova Heights playground and diamond field in a second phase of the project, but the county’s current funding squeeze means they aren’t yet sure when they’ll be able to afford that work. The following letter to the editor comes from Craig Esherick, a former chair of the Arlington County Sports Commission, former coach of the Georgetown Hoyas and husband of Commonwealth’s Attorney Theo Stamos. 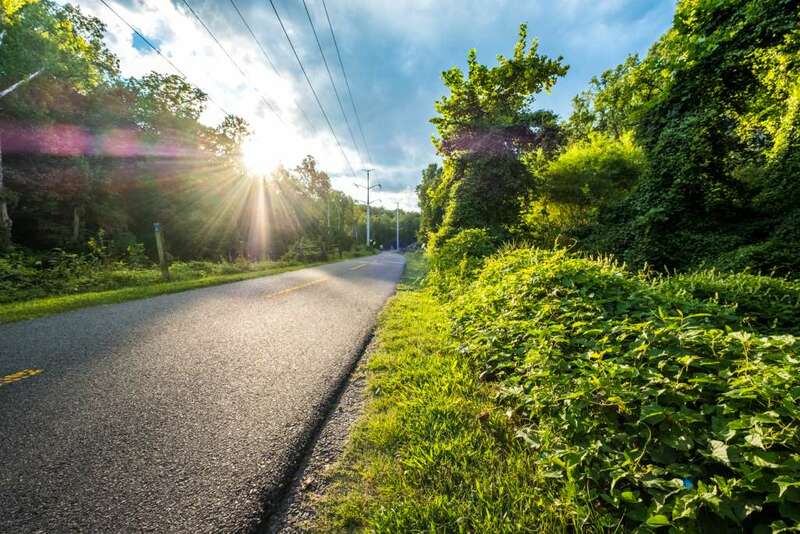 Esherick writes to express his support for the county’s recommendations in a draft of an updated Public Spaces Master Plan, a process otherwise commonly known as a “Plan for Our Places and Spaces” or POPS. The draft has come under fire from some county residents in recent months, who have argued that the document demands more land for new athletic fields than the county actually needs, particularly as Arlington grapples with a lack of land for all manner of public facilities. The Arlington Civic Federation also recently passed a resolution overwhelmingly urging county staff to withdraw some of their recommendations involving athletic fields. But Esherick argues that sports have a vital role to play in the county, and urges the County Board to consider their importance as it prepares to adopt a final version of the plan in the coming weeks. 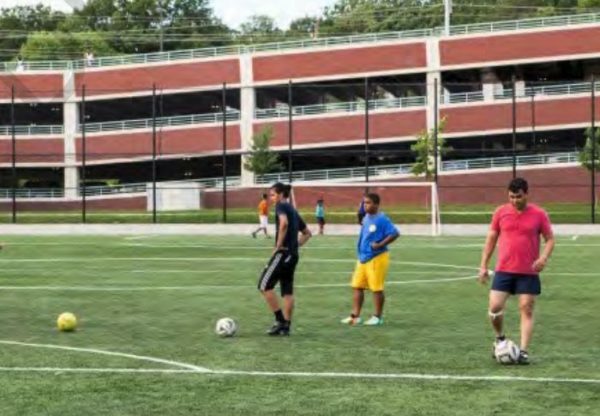 As a longtime resident of Arlington County and one who has dedicated my life’s work to sports as a coach, author, TV commentator and academic, I felt compelled to weigh in on a subject that is getting lost in the current debate about sports fields versus open spaces: the many benefits of sports to a vast cross-section of our community. My views are shaped by decades of county involvement through a period of tremendous growth and change. When I moved to Arlington in 1990, the population was 171,000. Today, it is 235,000 and expected to grow to 290,000 by 2030, but our footprint isn’t getting any bigger. Over the years, I’ve seen recreational and youth sports evolve to reflect the times. Both my sons played several sports in the county-sponsored leagues and for Arlington school teams. Demand for field space has exploded as our youth population grows and new sports have entered the scene. Compared to just 10 years ago, this demand had resulted in less weekly practice time, smaller practice spaces, and bigger teams in order to share limited field space among so many users. And this trend is likely to continue. Adults in Arlington are active field users as well. Adults of all ages enjoy playing soccer, softball, Ultimate Frisbee, kickball and other sports near where they live and work, and then socializing together afterwards in nearby parks or at area restaurants. Are these sports activities important to our community? As a lifelong sports enthusiast, the answer seems obvious. Yes, sports teach kids about leadership, teamwork, and working hard to perfect your craft. I’ve seen first-hand how character is built from lessons learned on the sports field. Yes, sports lure kids away from electronic devices and keep them physically active. Sports also provide myriad health benefits to young and old alike. But I would argue that the most important role that sports plays in our modern world is that it connects us to each other, and that is good for the community. As our kids participate in sports, they make friends from across the county which expands their world and breaks down barriers. Many of these friendships endure throughout high school and into adulthood. Studies show that the more young people play sports, the more they are engaged in school and in their community. These community benefits transfer to parents, who make new friendships and engage with others through the sports participation of their children. Sports also offer new residents a way to make friends and become part of the Arlington fabric. As Arlington continues developing its new 10-year Public Spaces Master Plan – a comprehensive, long term plan that provides direction on how the county should develop and maintain public spaces to serve a growing population – it is important not to lose sight of why this matters to the health and vitality of Arlington over the long term. Arlington values trees and parks and trails and dog parks, and it values its sports fields. Sports provide a community good and making room in our limited acreage to accommodate them is in the community interest. ARLnow.com occasionally publishes thoughtful letters to the editor about issues of local interest. To submit a letter to the editor for consideration, please email it to [email protected]. Letters may be edited for content and brevity. After two years of design and one year of construction, Tyrol Hill Park has finished the last phase of its construction and is open to the public. Tyrol Hill Park is a two-acre park adjoining the Forest Glen and Arlington Mill Neighborhoods, with connections branching out into the nature trails of Glencarlyn Park. Phase Four of the project finalized the park with a new restroom, picnic shelter, and paved plaza. Phase Four also added several furnishings to the site and added accessibility and stormwater management improvements. 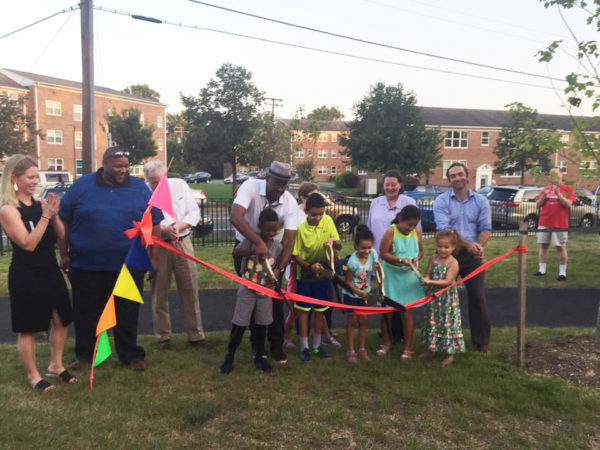 Earlier phases relocated and upgraded the Basketball and Volleyball Courts on the site, added a new gateway entrance, installed a new playground and added a picnic shelter. 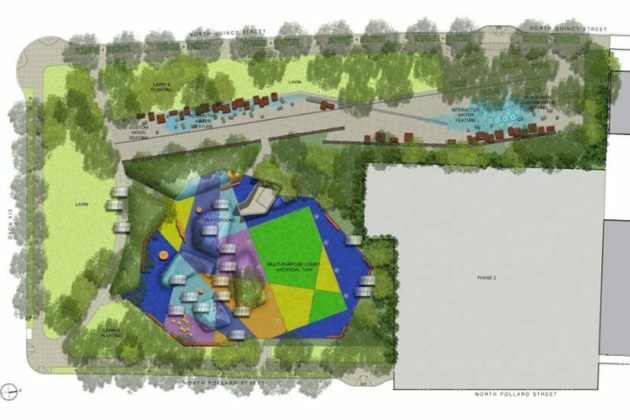 The Tyrol Hill Master Plan was adopted by the County Board in 2003, but after years of inactivity the project was revisited in 2016 when a community survey conducted by Arlington County staff showed there was still support for adding a unisex bathroom to the site and that renovating the paths around the site was a top priority. 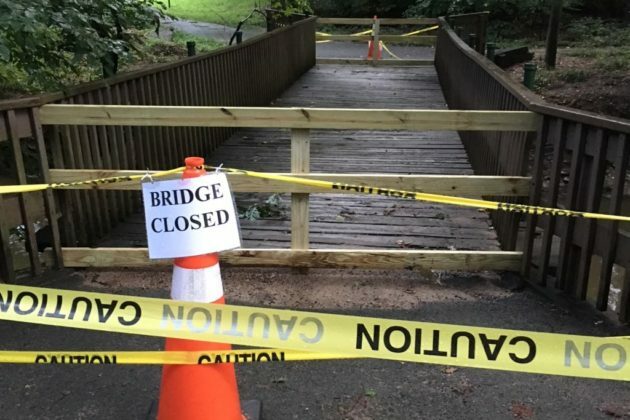 A bridge for walkers and cyclists in Lubber Run Park is now closed, at least temporarily. A tipster first notified ARLnow about the closure on Friday (Aug. 3). County parks spokeswoman Susan Kalish says workers checked on the bridge while doing some park maintenance, and subsequently decided to close it. 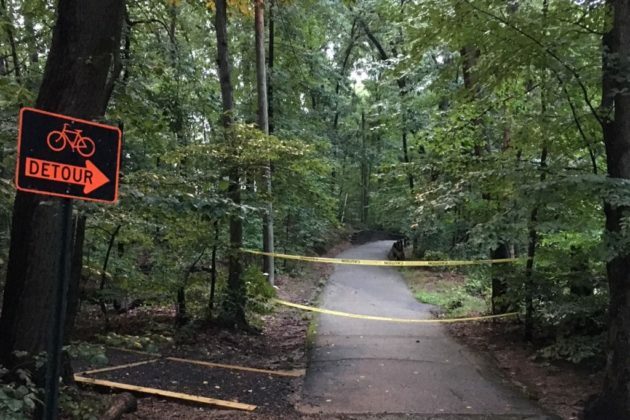 The county’s posted detour signs for anyone using the trail, and is directing walkers and bicyclists away from the bridge while work continues. The park, located at 200 N. Columbus Street, was recently the site of a community gathering to pay tribute to the soon-to-be torn down Lubber Run Community Center. 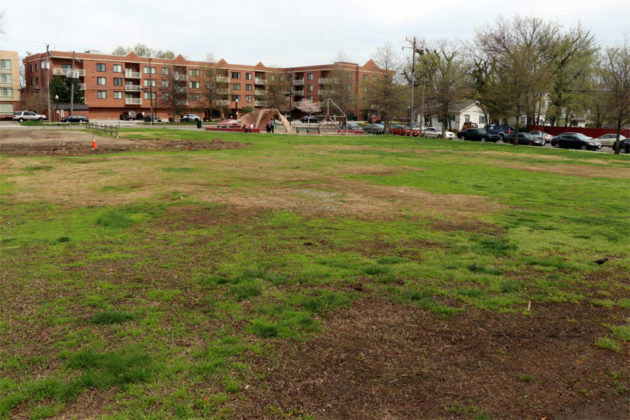 County workers now have the green light they need to kick off an overhaul of McCoy Park near Rosslyn and Courthouse. 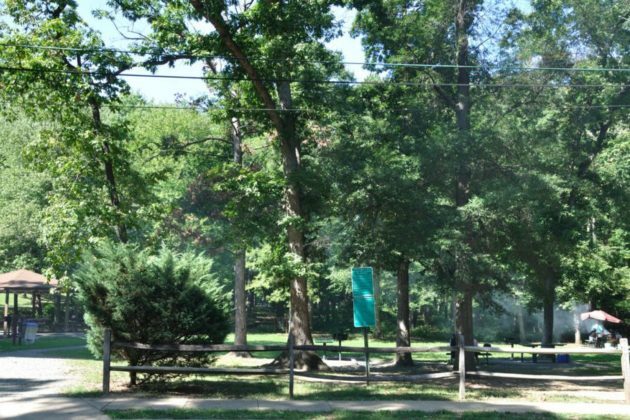 The Arlington County Board agreed to rezone the park at its meeting Saturday (June 16), allowing work on a series of improvements to the 1.1-acre property at 2121 21st Street N. to move forward. Parks officials have been working on plans for a renovation to McCoy since 2016, after the company behind the mixed-use development that’s home to the nearby MOM’s Organic Market (2145 Lee Highway) agreed to help fund the project. The county has not made major changes to the park since it opened in 1985. 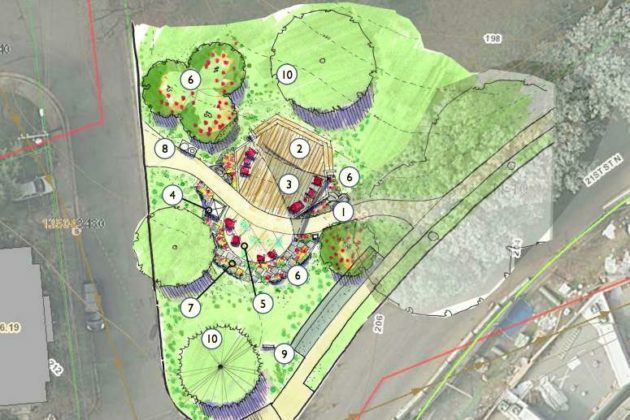 “Changes to the park will include a re-aligned sidewalk, a seating deck with furnishings, a shade canopy, and interactive chalk art plaza, new landscape vegetation, trash/recycling receptacles, and a new park entry sign,” county staff wrote in a report for the Board. The county is also hoping to add a dog waste bag dispenser and “Little Free Library” to the park, if it can find sponsors to help build and maintain either amenity. County staff note in their report that their next step is to submit construction documents for permitting, now that they earned the County Board’s sign off. They’re hoping to complete the improvements by the end of the year. 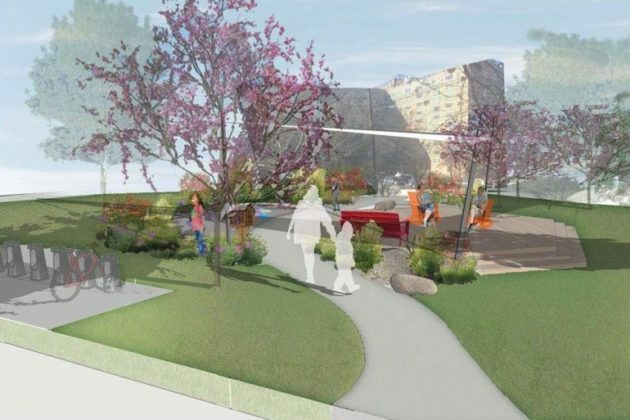 Arlington County is now hoping to kick off construction work on an overhaul of Ballston’s Mosaic Park early next year, following years of delays prompted in part by cost overruns. County officials are planning to finish renovations at the park, located at 538 N. Pollard Street just behind the Gold’s Gym parking lot, by the end of 2019. 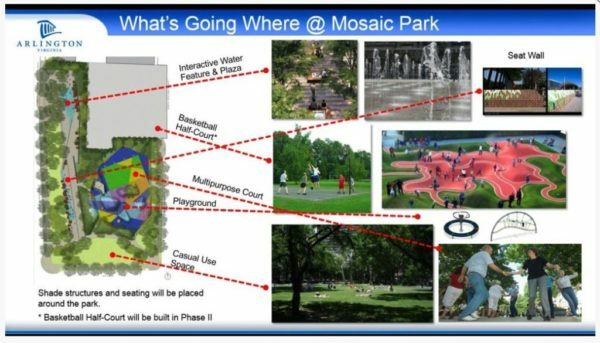 Planners unveiled an updated timeline for the park’s renovations at a community meeting last Wednesday (May 30), along with detailed designs for new features like a playground, plaza and athletic courts. The county’s eyed upgrades at the park back in 2008, and initially hoped that construction could begin in 2013. But planning work stretched on for years, particularly after its estimated construction costs overran the project’s budget. That forced the county to re-tool the project slightly to bring costs down, in part by eliminating some planned solar panels at the site that would’ve powered the park’s lighting and reducing the number of trees and plants to be installed around the park. The Shooshan Company, which owns some nearby developments, agreed to fund the first phase of the $6.6 million project. The county is also hoping to add a basketball half-court to the site, but that work will come in a second phase of the project. The county plans to award a construction contract next spring, and start work soon afterward. Officials hope to wrap things up by winter 2019. 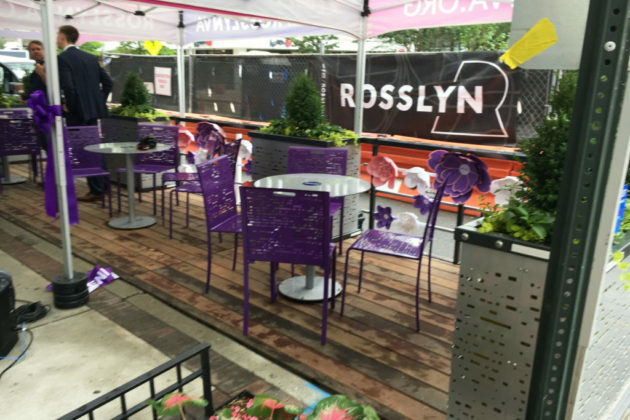 Arlington’s first “parklet” is now open to the public, providing a small splash of green space amid Rosslyn’s urban landscape — and perhaps giving county officials a new tool for adding more open spaces across Arlington. 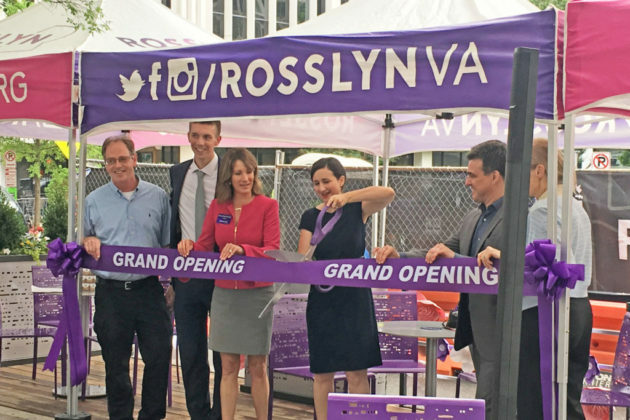 Rosslyn’s Business Improvement District teamed up with the county to design the mini-park, located adjacent to the Roti Mediterranean restaurant at the intersection of Wilson Boulevard and N. Oak Street. Starting today (Thursday), anyone can take advantage of the parklet, which is just 30 feet wide — about the size of two parking spaces. These sorts of mini-parks have become increasingly popular in heavily populated cities like New York and San Francisco, and Arlington tested out a temporary parklet at the same location last fall for PARK(ing) Day, an international event for cities to experiment with temporary green spaces built in parking spaces. Now, planners are hoping to make this parklet permanent, and even set up more elsewhere to help compensate for the county’s dwindling supply of available land. 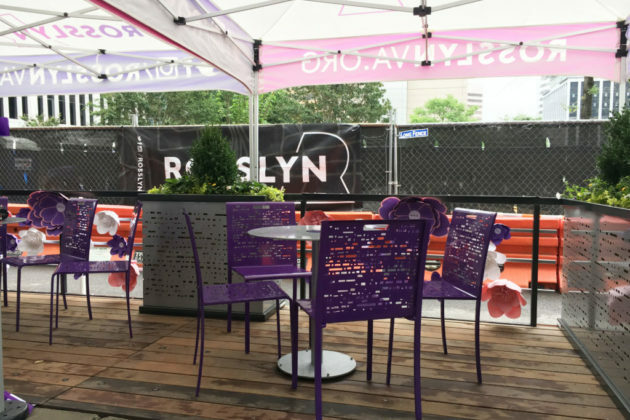 “It’s all about helping create an identity for Rosslyn,” deCordre said. She says the BID selected the space next to Roti because it didn’t have much existing sidewalk seating, and they needed “somewhere safe,” without too much vehicle traffic to test out a parklet. Ultimately, N. Oak Street ended up being an ideal side street for the mini-park to sit next to, deCordre said. But she didn’t want to simply see a few tables added to the sidewalk. She also wanted something that was both “flexible” and “user friendly,” so she made sure to include lots of greenery as well — the parklet includes a total of 18 chairs, five tables and four planter boxes. Arlington has the fourth-best park system in the entire country, just behind our neighbors across the Potomac, according to a new set of rankings from the Trust for Public Land. The county climbed two spots in the California-based group’s rankings from a year ago, earning a “ParkScore” of 81.6 out of 100. 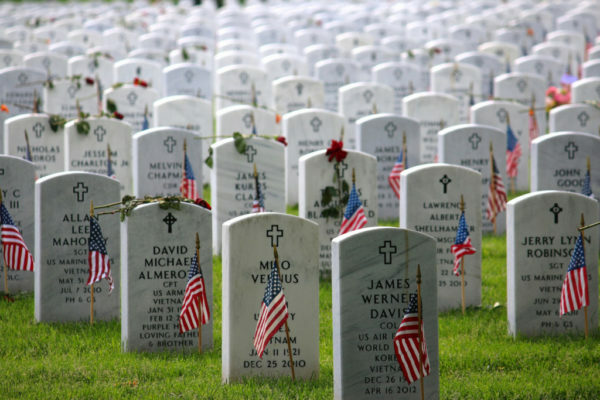 D.C. was just slightly ahead of Arlington at 81.6. Minneapolis took the top spot nationally with a score of 84.2, with its twin city St. Paul, Minnesota placing second with 82.4. The Trust for Public Land compiles the rankings based on four factors: the percentage of residents living within a 10-minute walk of a park, the percentage of a locality’s total area dedicated to parks, park spending per resident and the availability of popular park features. Arlington scored well on all of those factors, according to Ali Hiple, program coordinator at the trust’s Center for City Park Excellence. She noted that the county ranked fourth overall two years ago as well, and she believes Arlington’s parks system should be a “point of pride” for the county. Hiple’s group found that 98 percent of Arlington residents live within a 10-minute walk of a park, compared to the 70 percent average nationally. Hiple noted that researchers use mapping software to study distances not simply “as the crow flies,” but they take into account potential obstacles between people and nearby parks as well. “We’re measuring if it’s 10 minutes on foot, so that means it’s about walkability as well, which Arlington is certainly doing well on,” Hiple said. 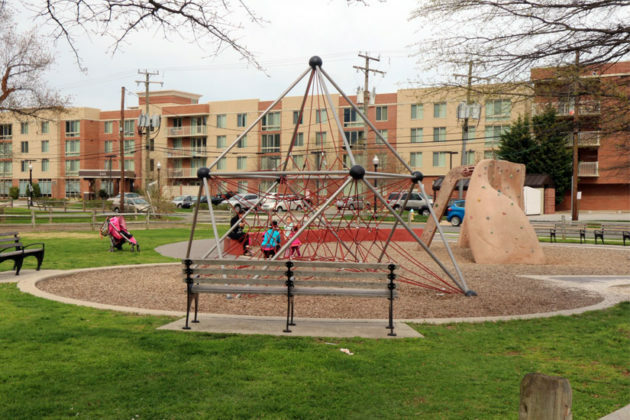 Arlington also performed particularly well in the group’s survey of access to park amenities, with lots of restrooms and playgrounds available for residents, she added. The county also earned full marks from Hiple’s group for its spending on parks; the trust found that Arlington spends about $240 per resident on the park system. Yet where the county fell the most behind D.C. is in the sheer acreage of park land available. The group found that 22 percent of D.C.’s land is reserved for parks, compared to 11 percent for Arlington. But Hiple said the county has nothing to be ashamed of in falling behind D.C., another frequent top performer in the group’s annual rankings. “They’re basically neck and neck, so we’re giving kudos to both systems,” Hiple said.